Staff were incredible. The room was cleaned very well every morning. The location is very good for visiting Cork. The location, for the price, is the best in Cork. Perfect access to all areas of the city! Restaurants, pubs, train and bus stations. Relaxed, chilled atmosphere. Close to museums, river, downtown, restaurants, great pub right across the street. The Staff were quite good, helpful and did everything asked. Excellent location right in the heart of Cork with friendly staff. Great prices rooms as well. Lobby very nice. Room clean. Beds comfortable. Breakfast was an additional charge but was a good value and very good. Right on the edge of a nice section of town with great pubs, bars, and restaurants. I loved the retro decor and the staff was very friendly and knowledgeable. The location was perfect. The location was very nice and the staff was wonderful. This place is really cute and is staffed by really friendly people. For various reasons we were a bit of a nuisance and they never appeared irritated. Right across the street is Sin E, a famous Cork pub, so if you want to experience that slice of Ireland all you need to do is walk across the street -- although note that if you're noise sensitive, you can hear music and comers-and-goers into the night as well (nothing too bad). There is also a bathtub in the rooms which is a huge plus for me (large and cute ones too) and the decor is quaint without seeming cheap. Ashley Hotel This rating is a reflection of how the property compares to the industry standard when it comes to price, facilities and services available. It's based on a self-evaluation by the property. Use this rating to help choose your stay! This friendly hotel with excellent service has a prime city-center location in the Victorian Quarter near shops theaters, galleries, vibrant bars and restaurants. Bustling St. Patrick's Street is just around the corner. 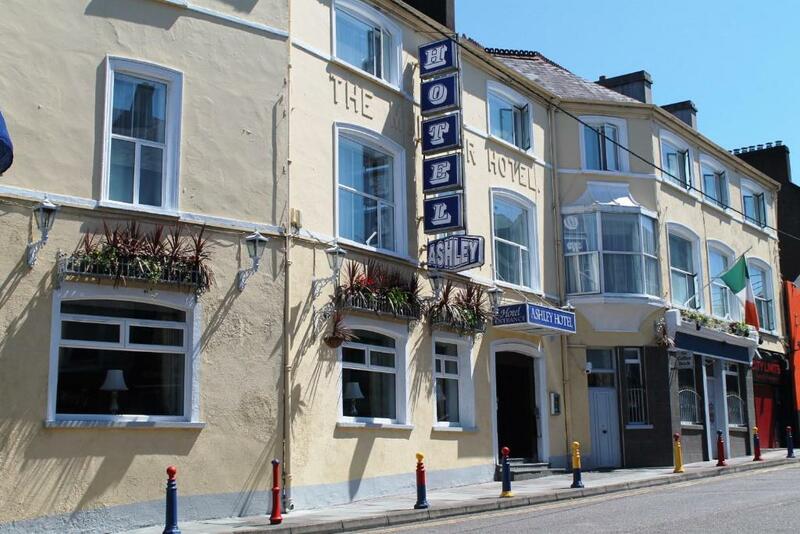 Ashley Hotel is within a mid -19th-century house and has a 24-hour front desk and a secure on-site car park with CCTV is available with limited spaces. Local stouts and beers and homemade meals are served in the ground-floor bar. Full Irish breakfasts or early breakfasts are available. The hotel is an 5 miles journey from the airport, and a 10-minute walk from the train and bus stations. Within walking distance is the English Food Market, Cork City Jail, City Hall, Cork City Harbor, Heineken Ireland and Cork Butter Market. When would you like to stay at Ashley Hotel? This room includes an private bathroom, Egyptian cotton towels, a hairdryer, a flat-screen TV with satellite and radio channels, complimentary tea and coffee and an ironing station. This room includes an private bathroom, Egyptian cotton towels, free Wi-Fi, a hairdryer, a flat-screen TV with satellite and radio channels, complimentary tea and coffee and an ironing station. This room includes, suite bathroom, Egyptian cotton towels, hairdryer, flat-screen TV with satellite and radio channels, complimentary tea and coffee and ironing station. House Rules Ashley Hotel takes special requests – add in the next step! Ashley Hotel accepts these cards and reserves the right to temporarily hold an amount prior to arrival. Please note that a limited number of free parking spaces are available on-site and parking is not guaranteed. The parking is closed between 21:00 and 6:30 each night. Overnight street parking and Sunday street parking is free. Guests under 19 years of age cannot check-in unless the lead guest is aged 21 years or over. Please note all cards will be preauthorised to guarantee the reservation. If you decide to use a different card for payment on arrival, please be aware that it may take up to 3 weeks for the pre-authorization amount to be released. This period varies between banks. Please note that there is no elevator access in the hotel. The property accepts Union Pay as a method of payment. The property has a strict no smoking policy. For bookings of 4 rooms or more, a 50% deposit and list of guests are required. Please inform Ashley Hotel of your expected arrival time in advance. You can use the Special Requests box when booking, or contact the property directly using the contact details in your confirmation. The rooms just need a little bit upgrades but for the price Id say it's a fair price to pay. The location was great close to all the shops and bus stops and quite at night. The staff was very friendly and helpful! Discomfort, very confined space in the room, entrance closed and locked at night, with 2 staff( bouncers) peering at us through a small gap in a chained door when we returned in the evening. Found the front of house lady(owner I think) to exceptionally warm, friendly & welcoming! Breakfast staff very accommodating and attentive. The room was really small. The water was not that hot. It's really old building. It was really expensive for no reason. The place was amazing close to the city centre. The staff it was really friendly. Very old fashioned. Tiny TV. Shower was not very powerful. The location is great. So close to St Patrick's Street where all the shops and restaurants are as well as bus stops. There are pubs across the road from the hotel as well which is great. It was very cold room for us, we slept really dressed. The equipment is basic. For one night it was ok, but for more days I would see other hotels. I like the staff, ladies were very helpful and nice. They reccomanded us some nice things to see in town and also they storaged our laguage. Wifi was good for us too. Everything was fine no problems, nice staff. Very nice place and i would like to stay again. Thank you so much. The breakfast wasn't great. Very cheap products and they way overcharge for it. You're better off walking around the corner to the shop and getting a much cheaper and tastier breakfast. I had been clearly told that our breakfast was complimentary due to online booking, and when I checked out I was told there would be no charges to my card. When I got home I received a phone call that they wanted to charge me nearly 70 Euro for the breakfast we had even though we only had cereals, toast, tea, and scrambled egg (and it was bargain brand crap food). I had to say no way to that!! That kind of ruined what was actually a fairly pleasant, if obviously budget, stay. It's a cheap place for a reason, if you go expecting 5 star you're fooling yourself. 99% of the staff were the loveliest people I have ever met. I stayed one night in a fancy hotel in Cork and the staff were stiff and cool, the staff at Ashley were so normal and kind, lovely people. The bathrooms were very large. The place was cleaned very well.